first of the series of four Elemental necklaces. 14-16" choker, sun rays are each 2"-3" long. 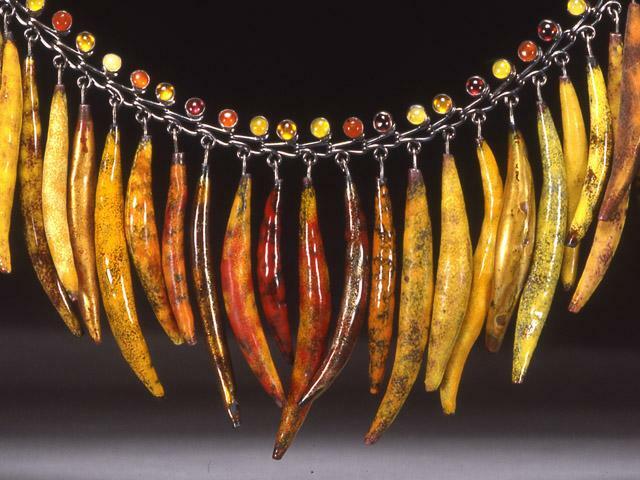 Copper, sterling, enamel, garnet, amber, carnelian, yellow opal. This piece focuses on the emotional impact of color. It gives one the feeling of power and vigor when worn. The beauty and longevity of enamel adds to this. Each sun rays are hand formed from a thin sheet of copper and colored with 3 to 5 layers of enamel, often letting the richness of the copper show through; no two are the same. The original is no longer available but a custom necklace in the same colors can be made. Earrings are also available and start at $180.